I recently needed to emulate an RS232 serial port in a Linux guest VM running in VirtualBox on Windows 7. 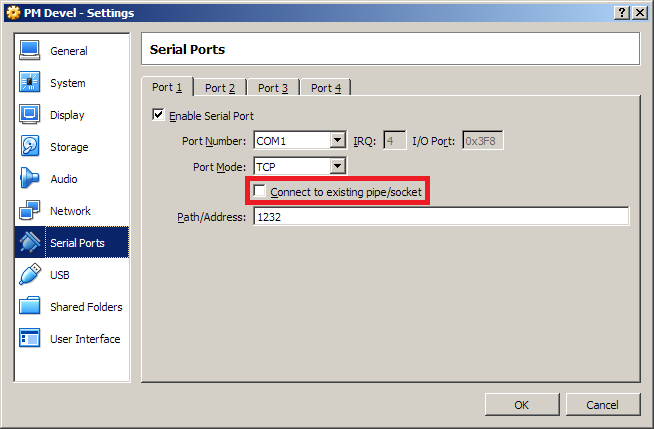 Specifically I needed to map the virtual serial port to a TCP network port. The instruction at 0xcdcfdcab referenced memory at 0x00000018. The memory could not be read. 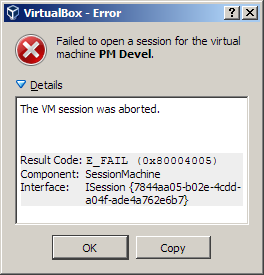 Failed to open a session for the virtual machine PM Devel. The VM session was aborted. I checked for problem causes using Event Viewer, VBox.log, Process Monitor, Procdump and WinDbg. Unfortunately none of these revealed the cause. This was checked by default. Tried unchecking the setting. The virtual machine could start normally and communication between the virtual RS232 serial port and the TCP network port worked. Be aware that a VirtualBox VM may also crash on shutdown in a similar way, if the TCP port is still connected.